FAQ: What is Legionnaires' Disease? An outbreak of Legionnaires' Disease began on July 10 and has caused seven deaths and 64 hospitalizations, according to the city's most recent numbers. 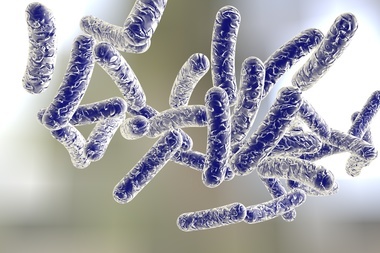 NEW YORK — With seven confirmed deaths citywide resulting from Legionnaires' disease, there are many questions about the illness. Legionnaires' Disease (also called Legionellosis) is a form of pneumonia caused by inhaling Legionella bacteria. The disease gets its name from a 1976 outbreak at an American Legion conference at a Philadelphia hotel. In that outbreak, 182 people contracted the disease and 29 people died, according to Encyclopedia Britannica. The largest known epidemic was in Murcia, Spain in 2001, when more than 300 people were infected. 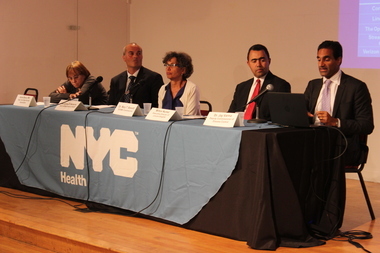 Health officials worked to educate Bronx residents about Legionnaires&apos; disease at a town hall meeting on Monday night. You can catch Legionnaires' Disease by breathing in water vapor contaminated with the Legionella bacteria. Mist from faucets, showers, whirlpools and air conditioning from cooling towers have been known to spread the disease. The bacteria grows in hot tubs, cooling towers, hot water tanks, large plumbing systems and decorative fountains. There have been no reported cases of it growing in car or window air conditioners. The disease CANNOT be spread between people, officials say. Most cases of Legionnaires' Disease are caused by infected water. However, in the South Bronx outbreak, because of the rapid spread and high number of cases, the city determined that the disease originated in cooling towers. You could come in contact with the bacteria inside a building with a contaminated cooling system, although some buildings have more sophisticated air filtration that would stop the bacteria from entering the air inside. In some cases, those susceptible to the disease could even catch it outside, somewhere near a contaminated cooling tower, according to Doctor William McCoy, who specializes in the study of Legionnaires' and how it spreads. Common symptoms of the disease are flu-like symptoms including fever, cough, chills and muscle aches. If you live in the South Bronx and have any of those symptoms the city's Department of Health urges you to see a doctor. People develop symptoms of the disease between two and 10 days after exposure to the bacteria. 4. How is it treated and how serious is it? Most people who ingest the bacteria don’t get sick. When it’s caught early, Legionnaires' Disease can be treated with antibiotics commonly used to combat other kinds of pneumonia. Certain people are more susceptible to catching the disease, including those who are suffering from more serious illnesses or conditions. Those include older people or people with weakened immune systems, people who’ve had organ transplants, people with weakened immune systems because of cancer or HIV, people with other underlying medical problems like diabetes or respiratory disease. Heavy smokers or drinkers can also be at risk. Four of the people who died from Legionnaires' Disease in the South Bronx were older adults with a history of other medical problems, officials said. 5. Where has the bacteria been found in the South Bronx? Once the outbreak began, the city scoured cooling towers in search of the bacteria and found it in five buildings: Lincoln Hospital, Concourse Plaza, the Opera House Hotel, a Verizon office building and Streamline Plastic Co.
All those buildings have had cleaning crews disinfect the cooling towers and will be required to give updated reports about the condition of the water, according to officials. “Disease detectives” are still hunting to determine the origin of the outbreak, according to the city.